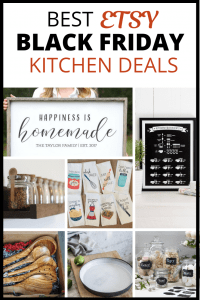 UPDATED FEBRUARY 2019 — Pin this post for 2019 Black Friday Deals! I will come back and update it when we get to November!! I don’t know about you, but I love a good sale. And you know what I love more than a good sale? Shopping at a good sale online. Etsy just came out with their Black Friday sale, and I just had to share with you some of the best Etsy Black Friday and Cyber Monday deals that I’ve found. I love Etsy because when I buy a gift or product there, I know that I’m supporting a small business. And you can find really fun and beautiful stuff there! 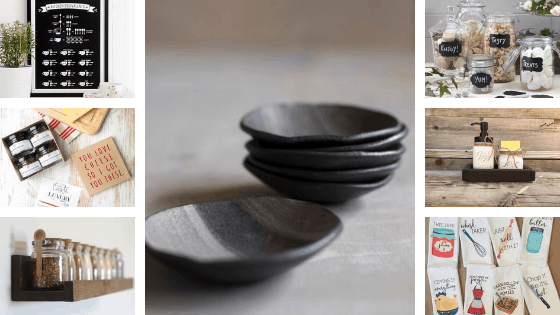 Whether you’re looking for a gift idea or you want to put some fun, handmade gifts on your own wishlist, you should definitely take a look at these finds! 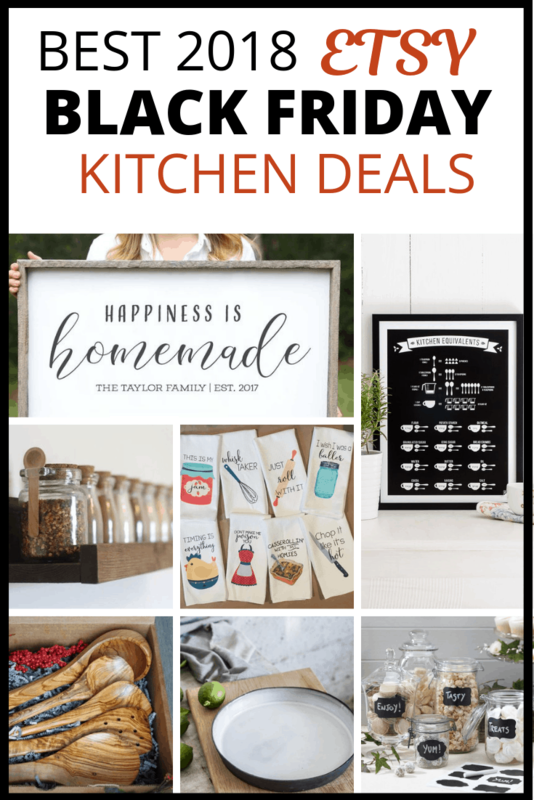 Kitchen Measurement Poster 30% off — Love this as kitchen decor. Cheese Lover’s Chutney Set 30% off — If you know someone who loves charcuterie, get them this set of four chutneys. They’ll love them! Check it out here! 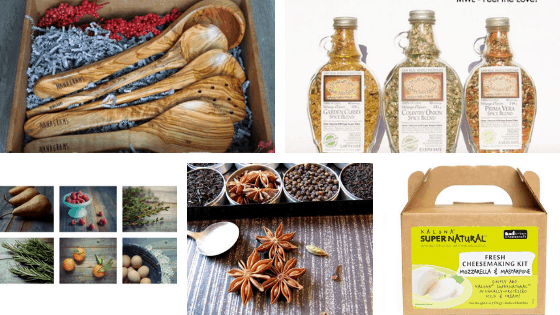 Rustic Wooden Spice Ledge 15% off — how cute is this? Buy some spice jars at Hobby Lobby and put them in this wooden spice rack. Tapa Bowls 15% off — This listing is for one of these tapa bowls. Use them for appetizer bowls! Chalkboard Stickers 10% off — Use these to label canisters or anything you like! Reusable and super inexpensive. Get them here! Mason Jar Soap Dispenser & Sponge Holder 10% off — I highlighted these in my Etsy Gift Guide and was excited to see them on sale. These would be a simple but sweet gift. Check them out here. Personalized Utensils 50% off — Get a name engraved on these wooden utensils. A perfect Christmas gift idea! Grab them here! Artisan Spice Blends 20% off — These look really yummy and get great reviews. Food Photography Prints 20% off — Four beautiful prints for your kitchen. DIY Chai Tea Set 20% off — What a cool and unique gift! Check it out here. Cheesemaking Kit 10% off — Make your own mozzarella and mascarpone cheese! So cool! Ceramic Baking Dish 15%off — I’ve had this in my favorites for a while. It’s a beautiful dish! Large Metal Gather Sign 15% off — this would be great in a kitchen or even living room. 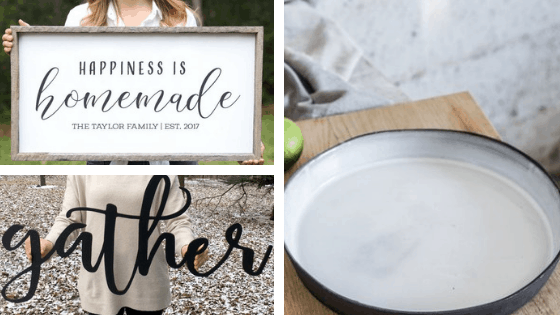 Happiness is Homemade sign 15% off — a classy sign that can be personalized for your own family. Grab it here! Wow, I did not know that Etsy had a black Friday sale as well! This is awesome. It was probably a lot of work putting this list together so thank you!! !